Irish War Cry (by Curlin out of Irish Sovereign, by Polish Numbers), was a multiple Graded winner on the Triple Crown trail who placed in the classic Belmont Stakes, by one of the leading stallions in the country. He stands at Northview Stallion Station in Maryland. Irish War Cry broke his maiden first-time out going 6 furlongs at Laurel, and then took the 7-furlong Marylander Stakes in gutsy fashion over more experienced foes to close out an unbeaten juvenile season. In his 3-year-old debut, Irish War Cry romped to a 3-3/4 length victory in the Grade 2 Holy Bull Stakes (earning a 101 Beyer Speed Figure) over Gunnevara and reigning Eclipse Champion 2-year-old Classic Empire. He later added a 3-1/2 length victory in the historic Grade 2 Wood Memorial (with another 101 Beyer) in his final Kentucky Derby prep. Prior to the Derby, his breeding rights were sold to Hill N Dale Farm in Kentucky (although their subsequent acquisition of Champion 2-year-old Good Magic, also by Curlin, eventually made Irish War Cry available to Maryland breeders). He later finished 2nd when favored in the classic Belmont Stakes, and returned as a 4-year-old to take the Grade 3 Pimlico Special by 4-1/2 lengths, good for a 100 Beyer. 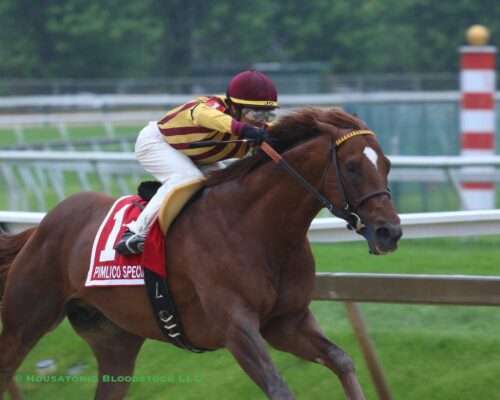 As mentioned above, Irish War Cry is a son of perennial leading sire Curlin, and he raced as a homebred for Isabelle de Tomaso, who bred him from a family deep with European classic blood. He was trained throughout his career by Graham Motion, who compared him favorably with Kentucky Derby winner Animal Kingdom. Retired to Northview with five wins and over $1.2 million in earnings, Irish War Cry will cover his first mares in 2019. You can see more photos of him here.